It all began in 2002, when a young student of only 19 years old started selling CD and DVD media at the local computer fare. Through hard work and determination the small business soon gained a mass following due to the unbelievable prices, much cheaper than any retailer. With so much demand, the Sunday stall simply wasnt enough. Customers were soon requesting media every day of the week and while we did our best to deliver something drastic had to be done. 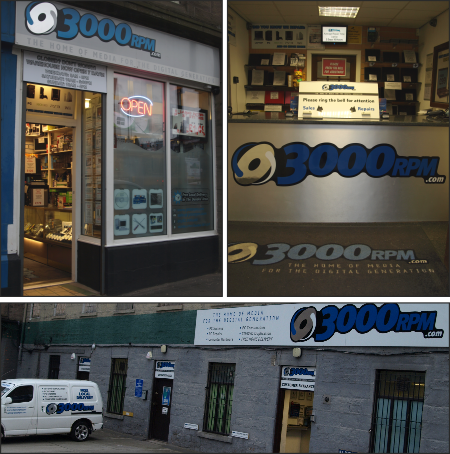 In early 2004 the first 3000rpm retail shop was opened in the Westport area of Dundee, Scotland. Initially starting with what we knew, our optical media soon became talk of the town and people flocked from all over. With a firm grasp on the media market, we then expanded into computer hardware and consumables in order to compete with the major retailers. Our customers appreciated speaking to staff who actually knew what they were selling, so much so that they started bringing their computer in for us to repair! With the limited space at the time this led us to repair computers in a small cloakroom at the back of the shop. Once again the company simply had to expand to keep up with the demand. We opened our second premise in Brown Street, Dundee in 2006 to deal with growing demand in both repairs and internet sales. This large warehouse opened more opportunities, allowing us to stock a larger range of items and buy in mass which resulted in cheaper prices for our customers. Our internet sales exploded with lower prices, allowing us to compete with already established big name internet retailers. 2008 saw the expansion of our Brown Street warehouse as the adjacent building was purchased. The good publicity we were receiving resulted in 3000rpm become known all across Scotland as well as becoming a driving force in the online computer, electricals and media sector. Through experience over the years, the staff at 3000rpm became the first choice with customers needing advice or with computer problems. At the same time, the core business was continually growing to a point where we had to acquire a larger premise. In 2009 the repairs team moved into our third warehouse next door in Brown Street where the additional space allowed for greater efficiency when building and repairing computers. Starting out as the odd computer here and there to fix in a tiny shop cloakroom to a fully fledged repairs department with staff working around the clock, we have come a long way. The repairs team now fix laptops, desktop computers, external hard drives as well as consoles making us easily the busiest repairs department in the area. With a busy year in 2010 we thought "why not just create a monopoly and get the final adjacent warehouse?". So we did! Now we have even more space to expand our disc duplication and customer services sectors of the business, resulting in a much more efficient set up to assist you, the customer! Starting out with fixing only one computer per week, this rose to one per day, then one per hour then so much we actually lose count! 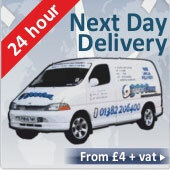 The same goes for our internet sales; starting out with a couple of orders per day and running down to the post office to send them off to van loads of orders collected multiple times per day from our couriers! The success story of 3000rpm would not be possible if we didnt treat our customers with the utmost respect. We go out of our way to explain and help all our customers in making choices in an area which lets be honest can be quite complicated. We would just like to thank all of our customers and staff for helping us along this journey and we will continue to bring big things in the coming years.